The human mind has an amazing capacity for memory. Ask a pianist who is capable to remembering precisely the key to the right note on the keyboard. Ask anyone who can remember their past. Ask anyone who can pinpoint exact places and faces straight from their memory bank. The human brain easily beats any world-class image processor, sound analyzer and technological gizmos that try to emulate the five major human senses. Yet, one of the saddest things about human being is the tendency to forget. The gift of memory can be neglected so easily in our daily lives. There are many reasons for absent-mindedness. A BBC report says it is due to ‘early stress.’ It is a popular belief that old age is also another factor. Dr David Myers, a psychologist comments on an experiment, that early adulthood (before one turns 40) represents the peak in terms of the ability to recall and remember. In that same project, there was an amazing 3x improvement in memory recall when the activity is repeated the third time. The conclusion is that, if lack of use can cause memory loss, an increased use will enhance memory recall. Deut 8 seems to emphasize this. God tells the Israelites that their duty is to regularly praise God for all the good providence showered upon them. In verse 11, there is a positive and a negative verbs, (a DO and a DO-NOT). Israel is to ‘keep watch’ or ‘be careful’ (positive verb); as well as ‘not forget’ (negative rendition of remember). In fact, Hebrew parallelism uses both to emphasize the main point, which is to honor God ESPECIALLY in times of multiple blessings. Lest we forget. Let me suggest two ways. The first is the important act of rituals. We need to repeat our family rituals as often as possible. In our families, special events like Birthdays, Anniversaries, and all manner of remembrance should be celebrated. In Church, we should hold fast to traditions of worship, prayer and various recitations of the creeds and doctrines. In the office, we need to continue to center ourselves back on the mission and purposes of doing what we are doing. In fact, leaders in any organization are not primarily called to get things done. Their primary task, I feel is to be able to bring the whole company back to the founding principles of the company. That is why mission and vision statements are core competencies of any organization. The leader is the one who is able to recall straightaway, to anybody at anytime, what the company stands for and why they are doing what they are doing. The leader is expected to repeat this mantra continually to employees at all levels, and to train managers to do the same. Failing which, the cycle of forgetfulness will slowly and surely take charge and eventually destroy the company over time. The second way to remember is actually a simple principle: De-cluttering. When we have too much responsibilities or things to do, our lives become cluttered and often confused. Not only will we face problems in prioritizing, we confuse the important with the urgent. What things are first in our lives? Who are the people that matter the most to us? What is our chief purpose in our daily work? Suppose you are asked to draw a 2-column table where these three questions are placed on the left side. 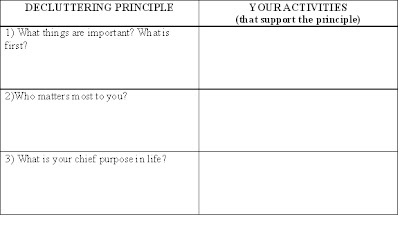 Write down all the activities on the right side of the table that support our statements of what’s important, who matters, and what’s our purpose in life. If it is a good list with solid details, good. If you find it difficult to fill in the right column, you are properly too cluttered up for long term good. If you feel cluttered, perhaps an exercise at decluttering your life will be helpful. Get down on your knees and pray. Talk to a friend. Read good books (including the Bible) pertaining to spiritual direction. Remember that de-cluttering means putting first things first, and to continually remind yourself of that. That way, we will remember.